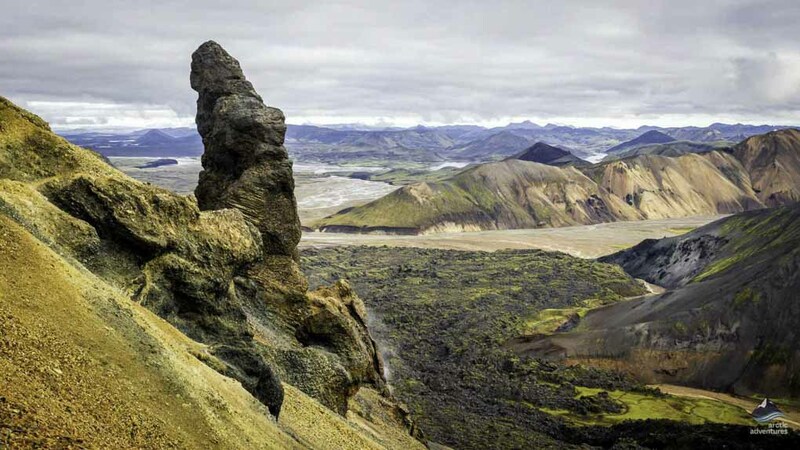 The Laugavegur and Fimmvörðuháls Iceland hiking tours will show you some of the most stunning vistas in the world. 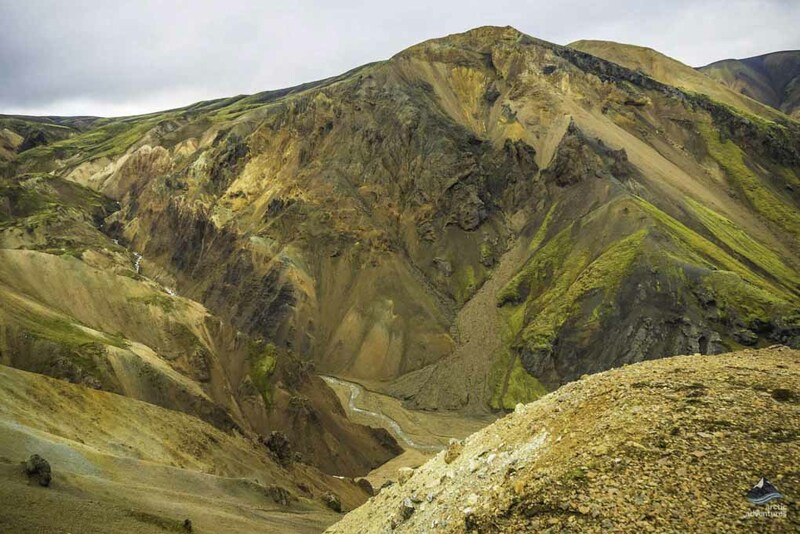 Colorful rhyolite mountains, geothermal hot springs, Eyjafjalljökull and new lava craters from the 2010 eruption at the Fimmvörðuháls Pass. 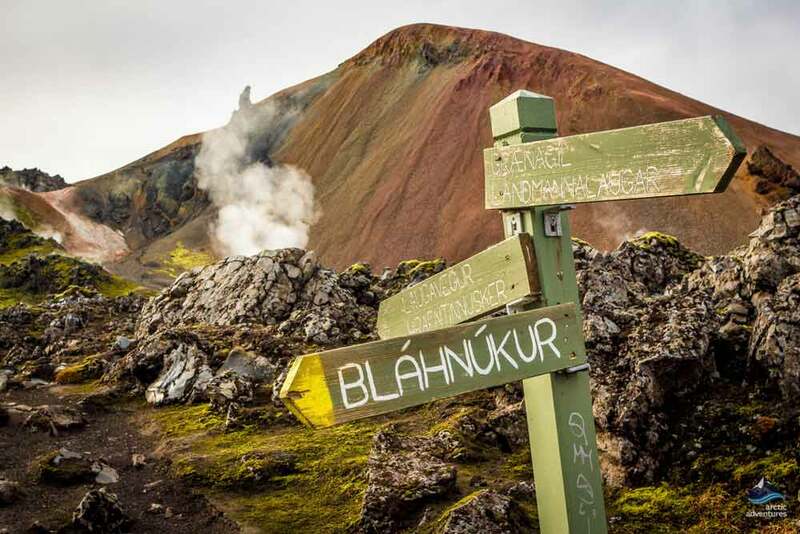 The Laugavegur and Fimmvörðuháls trek has been listed by National Geographic as one of the “World’s Best Hikes“. On this trail, you encounter truly unique and extremely diverse landscapes. Experience everything from sizzling hot springs and volcanoes to icy white glaciers. Walk through geothermally active lands of multicolored rhyolite mountains, fields of obsidian, cross glacier rivers… this list could go on for a long time and it only gets longer… the journey continues to amaze us. The campsites we stay at are located in remote areas of the highlands. Each area is unique, revealing new features in the ever-changing landscapes of the trail. 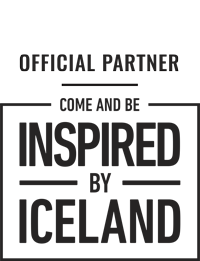 Enjoy meeting people from all over the world – be part of the team! 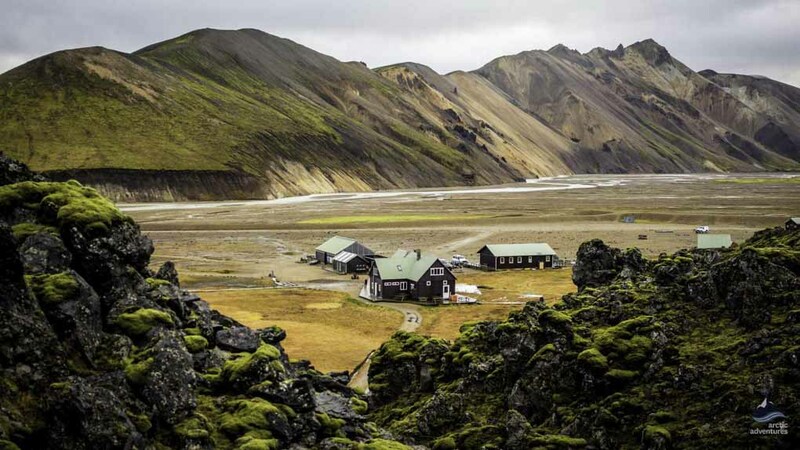 This six-day trek will really show you the Icelandic highlands. 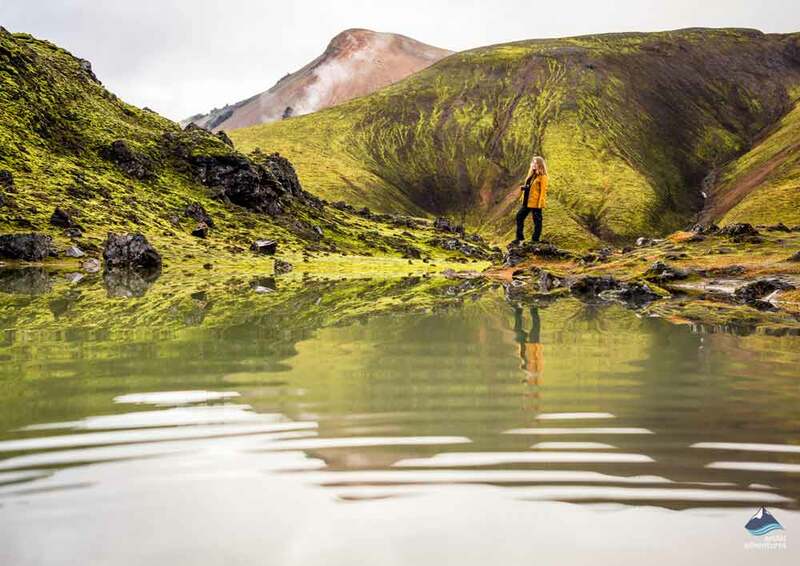 Be blown away by the otherworldly landscapes around Landmannalaugar – vibrant red and green hues of the rhyolite mountains and subdued caramel-colored peaks with mystical clouds of steam rising from the hot spring pool. This is just the appetizer! Cross the fields of obsidian on your way to Hrafntinnusker, one of the most remote camping sites in Iceland where we will set up camp. 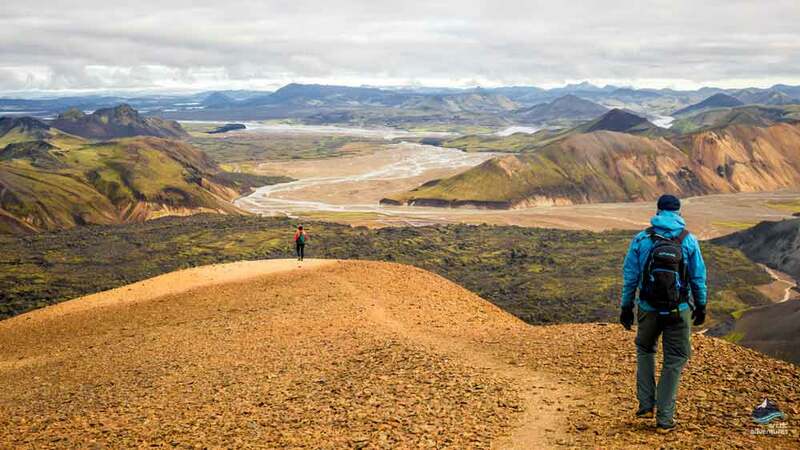 Day 2: The Laugavegur Trail will take you along the Reykjafjöll mountains and then into the Jökultungur area, from the top there are outstanding views over Fjallabak and Álftavatn (Swan Lake), we wade a stream on our way to the lake-side camping ground at Álftavatn. Day 3: Another stream crossing on foot then we hike up onto the black sands of Mælifellssandur, passing two volcano mountains, Stórasúla and Hattafell before, on a clear day, getting a view of Eyjafjallajökull. We see Markarfljótsgljúfur, a 200 m deep canyon, before camping at Botnar. Day 4: Hike close to Mýrdalsjökull glacier, passing the unicorn shaped Mount Einhyrningur, on the way to Þórsmörk, a lushly forested valley and the end of the trail. 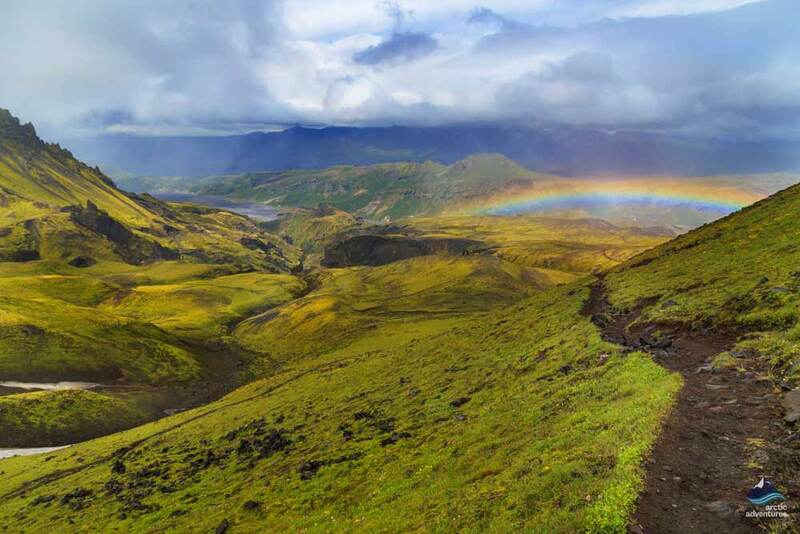 Trekking Laugavegur is so special! Camp at Þórsmörk, the valley of Þór, the Norse Thunder God. Day 5: Now for another trek Iceland, your Fimmvörðuháls hike! Flanked by the towering glaciers, Eyjafjallajökull and Mýrdalsjökull, head through the Fimmvörðuháls mountain pass to see Magni and Móði, new volcanic craters formed by the first 2010 eruption. This trek gives you the excitement of wading small rivers and deviating from the path occasionally. Camping at Þórsmörk, we celebrate with a farewell party and a traditional Icelandic grilled lamb dinner. Day 6: Leisurely breakfast then a hike up Mount Útigönguhöfði giving stunning views over the whole valley, or just relax around Þórsmörk. On the way back to Reykjavík you will glimpse the elegant waterfall, Seljalandsfoss, returning at around 18:30 in the evening. 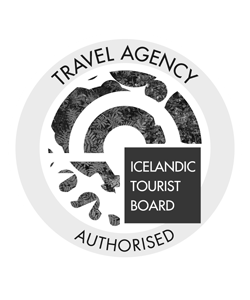 We meet at 07:00 a.m at the Tourist Information Center at Reykjavík’s City Hall on Vonarstræti. We introduce ourselves and board the scheduled bus which will take us to Landmannalaugar, the beginning of the famous Laugavegur trail. On our way we pass through farmlands and small towns and villages. We will begin the trek around noon. 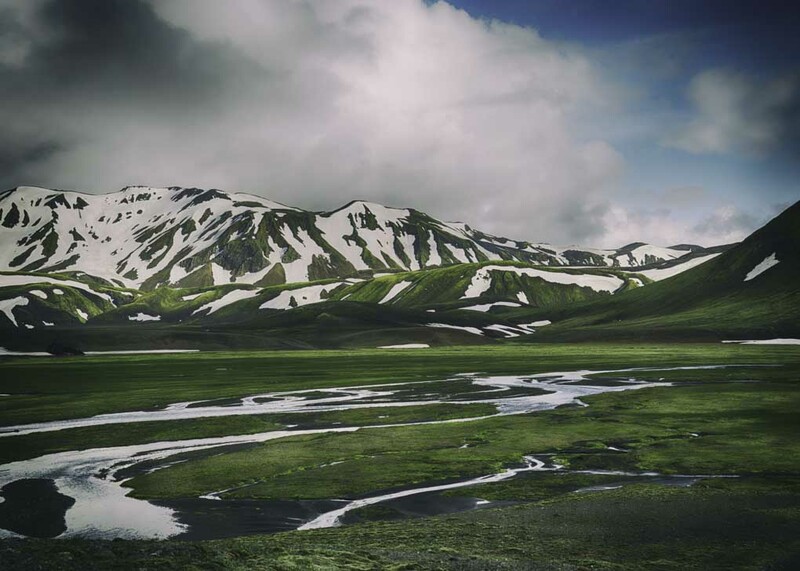 First, there is the opportunity to take a breath and really absorb the mystical landscapes around Landmannalaugar. You will feel you have entered another world as you watch steam wafting surreally across the surface of the geothermal hot spring pool, in a landscape filled with brightly colored rhyolite and soft creamy mountain peaks. Our destination will be the campsite at Hrafntinnusker, on the way we will cross the flinty raven blackness of the obsidian desert from which this place takes its name. The Icelandic word “hrafn” means raven, it is not necessary to be in Iceland for very long to realize that the name of a place is normally very descriptive of the appearance or features to be found there. Your guide will share some fascinating stories and geological information. The Hrafntinnusker camping ground is one of the most remote in Iceland. We get to know one another better – the kitchen tent is a great social hub! Distance: 12km (7.5 mi). Walking time: 4-5 hrs. Ascent: 470 m (1540′). After a nourishing breakfast in our kitchen tent, we head out for the second section of the trail, today our destination will be the lake-side camp site at Álftavatn (Swan Lake). 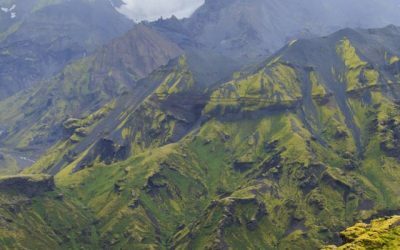 We will trek along the Reykjafjöll mountains and then onto the magnificent Jökultungur area, here the gullies have been painted vibrant shades of red and yellow by geothermal activity over the years. 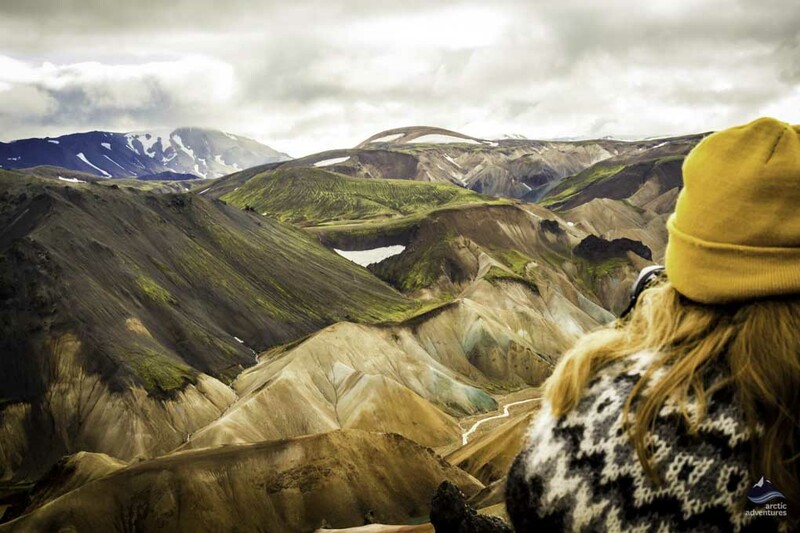 From the top of Jökultungur you will get fabulous views over Fjallabak and the lake, Álftavatn. To reach our camping ground we will need to cross an unbridged stream on foot – a new and exciting experience for many of the participants and a highlight for most! With our feet invigorated by the refreshing wade across the stream we will set up camp close to the lake. On a clear evening stunning and simply magnificent views will stretch as far as the eye can see in every direction. 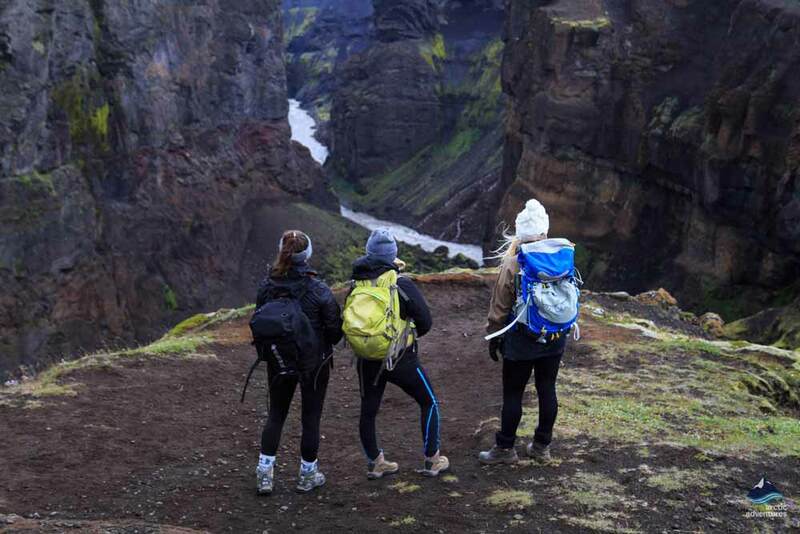 After an energizing breakfast your day will begin with another invigorating stream crossing as the trail takes us to Mælifellssandur, a barren but incredibly beautiful black sand desert. On the way we will pass two volcano mountains, the incredibly green Mount Stórasúla (Large Column), and Mount Hattafell, which has a rather strange flat top. 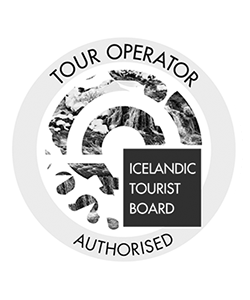 Our trek continues to Emstrur, in good visibility you will have truly spectacular views of Eyjafjallajökull and Mýrdalsjökull, both towering mountain glaciers, each shrouding a famous volcano beneath its ice. The famous (or infamous, depending on your viewpoint) Eyjafjallajökull probably needs no further introduction after the 2010 eruption which curtailed air traffic almost world-wide. Mýrdalsjökull is home to the mighty and capricious Katla, Europeans referred to this volcano as ‘The Gateway to Hell’ in the Middle Ages. We will deviate slightly from the trail to admire the Markarfljótsgljúfur, a magnificent 200 m deep canyon, shaped by the powerful actions of the glacial river, Markarfljót. Our camping ground for the night will be at Botnar, a refreshing green oasis surrounded by a black sand desert. 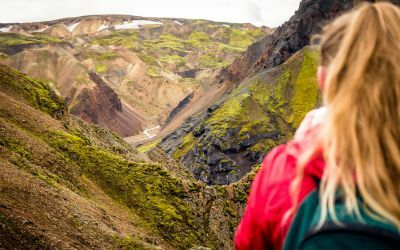 We say goodbye to Emstrur and continue with the final section of the Laugavegur trail which takes us into Þórsmörk (Thormork), a fertile valley with birch forests and abundant ferns, shrubs, other vegetation and remarkable mountain vistas. We will hike really close to Mýrdalsjökull, Iceland’s 4th biggest glacier. As we come closer to the valley of Þórmörk the landscape begins to change, an increasing number of trees will appear as we approach Almenningar, before we come to the birch forests around Þórsmörk. On our way we will pass Mount Einhyrningur (Unicorn Mountain) whose shape does, not surprisingly, resemble the single horned creature of myth and legend. 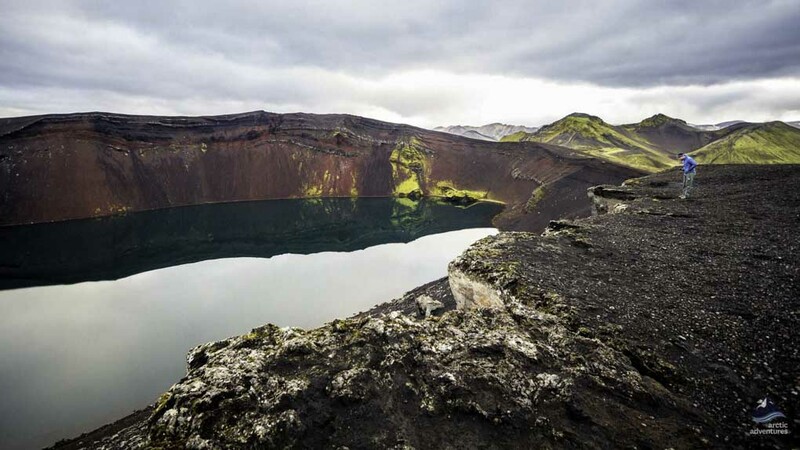 We will spend the night at the camping ground in Þórsmörk surrounded by mind-blowing and very peaceful scenery. 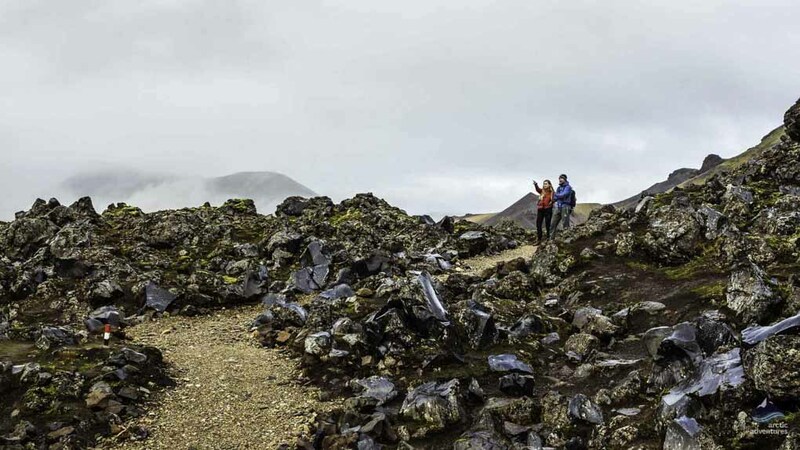 You have now completed the Laugavegur trail! Tomorrow there is the excitement of the Fimmvörðuháls trail. So celebrate a little but not too much! Distance: 15km (9.5 mi). Walking time: 6-7 hrs. Descent: 300 m (985′). Today the fabulous high mountain pass at Fimmvörðuháls and the two new lava craters formed by the first eruption in 2010 are on the agenda. After a rejuvenating sleep in the birch clad valley and a good breakfast we will be ready to set off early in the morning. This is the last full day of our hiking trip but there is still plenty to look forward to! The trail will take us up through the high pass between the twin glaciers, Eyjafjallajökull and Mýrdalsjökull. These two giants of fire and ice will flank us throughout the day, the totally stunning views are sure to leave you absolutely spellbound. Just when you are running out of superlatives to describe the vistas which are opening out all around you, something even more spectacular will leave you standing in wordless wonder. 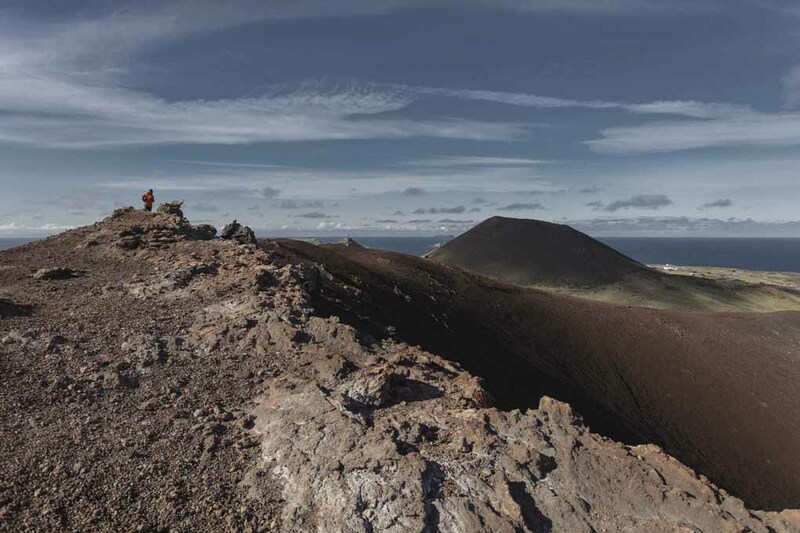 You will see the place where the new lava field, Goðahraun, was created in 2010, together with Magni and Móði, the two volcanic craters formed at that time. Magni and Móði are named after sons of the Norse Thunder God, Þór (Thor), their names mean strong and brave. Heading back to Þórsmörk you will capture a different perspective on this stunning scenery. 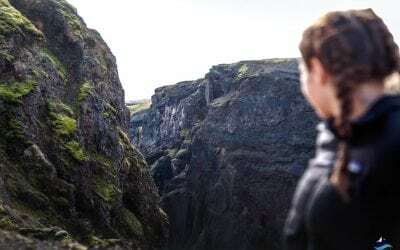 Your final night will be spent in Þórsmörk where we enjoy a farewell party, celebrating in the traditional Icelandic way with a grilled lamb dinner. Distance: 16km (10 mi). Walking time: 7-8 hrs. Ascent: 800 m (2600′). Today we start a little more slowly with a leisurely breakfast. We can then take some time to explore the amazing Þórsmörk surroundings before we make our way back to the city. There is a final hike up Mount Útigönguhöfði giving a fantastic overview of the whole valley. Those who prefer to can simply spend more time relaxing and enjoying the spectacular nature in this very beautiful place. On the journey back to Reykjavik, you will get a glimpse of the majestic waterfall, Seljalandsfoss, one of the most popular attractions in Iceland. We return to Reykjavik in the early evening at around 18:30. There is a final hike up Mount Útigönguhöfði giving a fantastic overview of the whole valley. There is also the option of a more gentle but still very lovely hike to the valley of Húsadalar (House Valley). Those who prefer to can simply spend more time relaxing and enjoying the spectacular nature in this very beautiful place. On the journey back to Reykjavik, you will get a glimpse of the majestic waterfall, Seljalandsfoss, one of the most popular attractions in Iceland. We return to Reykjavik in the early evening at around 18:30. 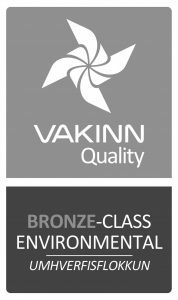 Drop off is available at Miklabraut 101 Orkan gas station (by Kringlan shopping mall), Reykjavik Campsite and the City Hall on Vonarstræti. Taxis and local bus services are available from these points. Distance: 6 km (3.5 mi). Walking time: 3 hrs.